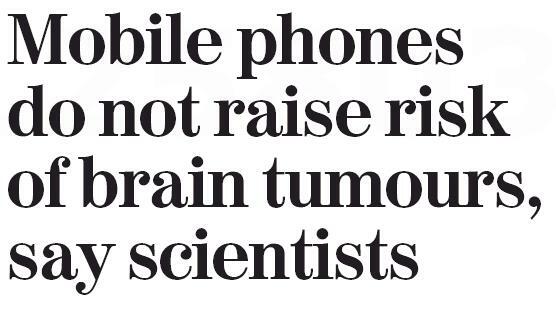 The 10 year long, 20 million euro Interphone study into brain cancer and mobile phone use has finally been published, but the way its launch was handled led to contradictory headlines and confusion among journalists trying to communicate its important findings. Click here to listen to New Zealand scientists who contributed to Interphone explaining its findings. So basically, using cellphones is relatively safe, but because we are using them for longer periods of time that when the study took place, we need to do some more studies, particularly in kids, who may be more susceptible to electromagnetic radiation when their brains are still developing. Interphone threw up a few strange things – for instance, it found a lower odds ratio for brain tumors relative to regular mobile phone use, something researchers have put down to “participation bias or other methodological limitations”. Long before its launch, Interphone was criticised for its methodology and bickering among scientists involved repeatedly delayed its findings being made public. A flurry of inaccurate stories based on leaks last October in the UK media suggested Interphone would be released in December. 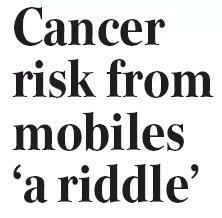 But December slipped by without any official word from the Paris-based International Agency for Research on Cancer. As someone interested in making sure the New Zealand media had a decent heads-up on Interphone, I made early attempts to make sure we knew when the study was coming. But getting information out of IARC was extremely difficult, even communicating with them was challenging. Finally a couple of weeks ago we heard Interphone was about to be published. Then the WHO made the unwise decision of releasing an embargoed press release with a link to the research about a week prior to the embargo time on the research. This release apparently only went to researchers involved in Interphone, but that involved a lot of people and the link to the research was not protected by a log-in. After all the leaks, controversy and inaccurate reporting, expecting an embargo to be respected on a global scale was asking for too much, as Embargo Watch points out. The LA Times has more on the embargo break here. The result was that Intephone, the results of which were embargoed to 1.30am Paris time on May 18th, leaked like a sieve on Sunday (UK time) with stories based on snatches of information appearing in The Sunday Times, The Telegraph and the Scotsman. By late Sunday night, Reuters and AFP were running the Interphone results and the number of news organisations breaking the embargo grew. Nevertheless, IARC refused to lift the embargo. Journalists who wanted to cover the story properly were then in the awkward position of seeing CNN, AFP, Reuters and many other media organisations running the Interphone study, and deciding whether they should follow suit and break the still existing embargo. All of that ended around midnight last night when the WHO belatedly decided that the horse had well and truly bolted and lifted the embargo on Interphone. As a result, some New Zealand media outlets ran the story last night and this morning while others, mindful of the embargo decided to hold off, unaware that the embargo would be lifted at midnight. Those who respectfully waited missed out on running the story at the same time as everyone else. Sure, Interphone’s results aren’t straightforward – high-frequency users appear to be more susceptible to brain cancer, the study found but issued the caveat: “Biases and errors limit the strength of the conclusions that can be drawn from these analyses and prevent a causal interpretation”. Nevertheless, I think the WHO could have avoided some of the polarized coverage of the Interphone study if it had managed the communication of it more successfully. A: Limited release of embargoed material to 48 hours maximum. B: Communicated more effectively earlier with media around the world about the timing of Interphone’s release. C: Foregone publication in a peer-reviewed journal in favour of publishing it publicly to its website for all to see, still peer-reviewed but not tied to any particular publishing schedule. D: Been far more decisive in lifting the embargo once Interphone was in the public domain. E: Answered phones/emails at WHO and at IARC in Paris! Such an important, expensive and globally significant study deserved better treatment.